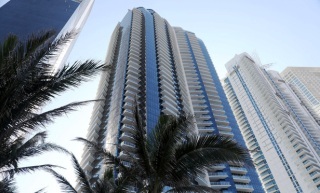 Jade Ocean, center, is a high-rise condominium at 17121 Collins Ave. in Sunny Isles Beach. Panama-based Ocean Tower Holdings originally sued Fortune International affiliate Fortune Ocean LLLP on Aug. 29. Iver, its successor in interest, filed an amended complaint Jan. 29 to add Defortuna, Fortune International and a slew of affiliates as defendants. The lawsuit lists declaratory relief, reestablishment of a lost promissory note, breach of contract, unjust enrichment, negligent and fraudulent misrepresentation counts as well as three fraud counts alleging fraud in the inducement and breach of fiduciary duty. Iver’s lawsuit was filed by Marcus Law Center founder and managing Alan Marcus in Coral Gables. A pending motion now seeks to merge this case with a similar one filed by project investor Florida Beach Investment Corp. Together the two cases bring the claims amount to $2.5 million. Barakat Law principal Brian Barakat filed the Florida Beach case. The complaint alleges Fortune International and its affiliates made misrepresentations to Ocean Tower, now Iver, both before they signed a loan agreement and again when it was time to repay the money. Fortune’s affiliates and an outside consultant, who also is a named defendant, falsely said most of the Jade units were sold before construction and the unit contracts were enforceable to persuade Ocean Tower to lend, according to the complaint. Then Fortune and its affiliates created fraudulent financial statements and hired an outside auditor, HLB Gravier LLC, to confirm the project lost $62 million, according to the complaint. HLB Gravier is a co-defendant. “I am sure that after adjudication of the matter it will be shown that the allegations against HLB Gravier are categorically lacking in factual and legal basis,” said HLB attorney Gary Shendell, managing partner for Shendell & Pollock. Iver’s forensic analysis showed Jade Ocean might have been profitable and Fortune wanted to make it look as if the project didn’t make money, according to the complaint. Research by consulting firm Condo Vultures LLC found Jade Ocean was completed in 2009 and sold out in April 2012 for a total of $377.9 million at an average of $713 per square foot. Fortune International general counsel Olga de los Santos denied the allegations in the lawsuit and said the developer will seek dismissal. “These are baseless allegations made almost a decade after Fortune Ocean built and delivered the Jade Ocean condominium to buyers in the midst of the worst real estate collapse South Florida has ever seen,” she said in an email. Fortune International lost money on Jade Ocean because the unit sales closed after the housing crash, de los Santos added in an Oct. 24 motion to dismiss the original complaint. “Aspirations of profit however (were) never realized because before defendant could close on the sale of the units, the South Florida real estate market collapsed, causing a precipitous decline in real estate prices that left the value of the project’s condominium units underwater resulting in the loss indicated on the financial statements,” she wrote in her response, adding the plaintiff seems to have misinterpreted the statements. The lawsuit, while it seeks loan repayment only for Iver, alleges Fortune International stole from other lenders and investors by funneling money through its many affiliates involved in the project. For example, Fortune International Management Inc. stole $8 million of investors’ money by collecting inflated administrative fees, and Fortune Development Sales Corp. took $19.8 million by inflating its commission fees, according to the lawsuit. “These affiliated entities would siphon off money from the project in comparatively small amounts over the life of the project from 2004 to 2012 and possibly through the present,” the complaint said. In addition to working as a developer, Fortune International offers brokerage, property management and financing services. It is part of the development teams for the Ritz-Carlton Residences Sunny Isles Beach, Auberge Beach Residences & Spa Fort Lauderdale and Jade Residences at Brickell Bay, also part of its Jade portfolio.